What's the Big Deal about Gluten? Have you ever wondered why so many people are going gluten free? Is eating a gluten free diet safe? What about women trying to conceive, pregnant, or breastfeeding? Let's take a moment to explore these issues, so that you can consider if this is something that could help you reach your wellness goals. Simply put gluten is the protein in wheat, barley and rye. People with celiac disease, an autoimmune disease triggered by gluten, must avoid gluten completely. However, Gluten is often blamed for contributing to a myriad of other health problems including: digestive problems, skin issues, brain fog, ADHD, joint problems, infertility, and inflammation. Many people report wonderful results after embracing a gluten free diet. One way to check if gluten is affecting your system is through an elimination diet. When doing an elimination diet gluten is strictly avoided for at least 30 days. It is then intentionally reintroduced, and any reaction is carefully noted. It is important to know that symptoms may appear immediately after eating gluten, or may appear a couple of days later. These symptoms may include digestive issues, skin trouble, depression, low energy, etc. What are some tips for going gluten free? It is important to recognize that not all gluten free food is healthy. Rather than switching your breads, pastas, and baked goods for the gluten free version, I would opt for nutrient dense foods such as fresh vegetables, fruits, and meats which are naturally gluten free. Replacing the typical processed foods in our diet with gluten free processed foods, will not give our bodies what they need to thrive. Is there a downside to eliminating gluten? There is nothing in gluten that your body needs, so your diet won’t be deficient simply from avoiding it. My biggest concern with people going gluten free is if they become overly fearful unnecessarily. 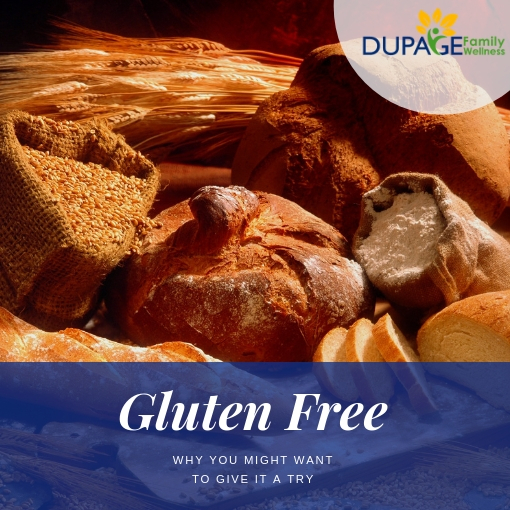 Unless you have Celiac Disease, or notice an impact from gluten after doing an elimination diet, it is likely that you can tolerate some amount of gluten. While it doesn’t need to be a staple in your diet, cutting it out completely can cause a lot of stress especially in social situations. Since we know social connections are important to our health, I don’t want an unwarranted fear of gluten impacting your ability to have a rich social life. As always, I am here to support you in your wellness journey! So if you need some extra support, feel free to schedule a nutrition consultation where we can explore what dietary changes may be best for you.